Your air conditioner, heat pump, or furnace probably uses a lot of energy. Heating and cooling makes up about half of the total energy use in a typical house. For air conditioners and heat pumps using electricity generated in fossil-fuel fired power plants, the amount you use at home may be only a third of the total. A question I get asked frequently is whether or not it's OK to close vents in unused rooms to save money. The answer may surprise you. The photo above shows a typical vent for an ducted HVAC system (air conditioner, heat pump, or furnace). On the return side, you'll typically see plain grilles, but on the supply side, where the conditioned air gets blown back into the house, most HVAC contractors install registers like the one above. It has a lever of some sort that allows you to adjust the louvers behind the grille. You'd think that since it's adjustable, it must be OK to open or close it to suit your needs, right? The important thing to remember here is that no matter which type of blower motor your HVAC system has, it's not a good thing when it has to push against a higher pressure. In a well-designed system, the blower moves the air against a pressure that's no greater than the maximum specified by the manufacturer (typically 0.5 iwc). The ideal system also has low duct leakage. The typical system, however, is far from ideal. Although most systems are rated for 0.5 iwc, the National Comfort Institute, which has measured static pressure and air flow in a lot of systems, finds the typical system to be pushing against a static pressure of about 0.8 iwc. Now we're ready to address the question of closing vents. When you start closing vents in unused rooms, you make the duct system more restrictive. The pressure increases, and that means an ECM blower will ramp up to keep air flow up whereas a PSC blower will move less air. Most homes don't have sealed ducts either, so the higher pressure in the duct system will mean more duct leakage, as shown below. If air flow is low, it'll dump less heat into the coil in summer, and the coil will get colder. If there's water vapor in the air, the condensation on the coil may start freezing. You might even end up with a block of ice, as shown in the photo below. And ice on the coil is really bad for air flow. It's also bad for the compressor as not all of the refrigerant evaporates and liquid refrigerant makes its way back to the compressor. If you want to have to buy a new compressor, this is a good way to do it. You're not guaranteed to get all the problems that apply to your system, but why take the chance. I recently wrote about all the IT folks who are trying to follow in Nest's footsteps and profit from the home energy efficiency movement. I used the Aros smart window air conditioner as the example of companies that think you can solve problems just by creating a product with a smartphone app. Well, meet a more malignant idea: the E-vent. (You can find it easily enough by searching on the term "Kickstarter E-Vent.") It's just a Kickstarter project right now, and maybe it won't get funded. If it does get funded, however, it will be subject to all the problems I described above. It doesn't matter whether you close the vents by getting up on a ladder in your home or from the beach in Cozumel. It's still a bad idea. The E-Vent page on Kickstarter says they monitor the air temperature and open vents if the temperature gets too cold while air conditioning or too hot while heating. Of course, that’s not going to work unless they monitor the temperature right at the coil or heat exchanger. And that still probably wouldn’t work because there’s a wide range of acceptable temperatures for different systems. This is an HVAC product developed by people who don't know some very important principles of heating and air conditioning. Let's hope they don't kill anyone. The fundamental problem here is that closing supply vents in your HVAC system changes what comes out in particular locations. It doesn't change what the blower is trying to do. Nor does it change the amount of heat the air conditioner, heat pump, or furnace is trying to move or produce. It's possible you may be fine closing a vent or two in your home, but it will depend on how restrictive and leaky your duct system is. If it’s a typical duct system with 60% higher static pressure than the maximum specified, closing even one vent could send it over the edge. If it’s a well designed system with low static pressure and sealed ducts, you shouldn’t have a problem as long as you don’t try to close too many. The only way something like this could work is if closing a vent signaled the blower to move less air and the air conditioner, heat pump, or furnace to move or produce less heat. (Properly designed zoned duct systems do this by using variable speed ECM blowers with multi-stage systems.) Otherwise you're subject to those 7 unintended consequences, one of them potentially deadly. Thanks to Curt Kinder, David Butler, John Semmelhack, Eric Sandeen, and Dale Sherman for suggestions in the comments below that made this article better and more complete. The earth is NOT flat! Blindly believing in "makes sense" common sense is flat earth thinking. We close lots of vents, automatically, many times per day...in our zoned heat pump HVAC systems. Oh yeah, no return bypass dampers allowed, either. It is too easy for those to cause iced coils and blown compressors. Curt K.: Thanks for mentioning zoned systems. What you describe meets the requirements I stated at the end of the article. When you close off vents — or whole duct runs, as in a zoned system — your zoned system also changes the amount of air flow and heating or cooling capacity. Awesome! An HVAC guy yesterday was just talking about how closing vents saves energy, and I was caught a bit flat footed on the reasons that's a bad idea, thanks for the great explanation! As far as comfort goes, lower/higher surface temps in those rooms could lead to mean radiant problems in adjacent rooms, correct? Nate - ask the HVAC guy to PROVE that closing vents saves energy...by "prove" I mean gather all relevant data with vents closed vs open. A home with oversized ducts and properly sized equipment MIGHT save a few percent by closing vents to 1-2 unused rooms, but when is the last time you came across oversized ductwork? Bill - Possibly the best zoning system available for homes is Carrier's Infinity system. Its dampers are true modulating and it best manages excess air when just a small zone is calling. If the wallet isn't fat enough for Infinity, there are ways to compensate for minimum system airflow using off-the-shelf zoning gear. Any HVAC contractor whose zoning approach incorporates a return bypass should be sent packing. All of Allison's writing about further restricting likely-already-crappy ductwork are spot on. The Kickstarter people are in dire need of adult supervision and oughtn't be left alone with sharp tools or live circuits exceeding 9 Volts. So what should be done about people/rooms that have different needs after a system is installed? For example, in our home the wife has an office that is too cold for her, and I have one that is too hot. We would trade but her office is larger and she needs the space. The rest of the house is comfortable overall, but these two rooms remain a problem. I can tolerate being overly hot, however she has trouble with being so cold. If I turn the thermostat up, the whole home becomes too warm and my office becomes unbearable. The only solution I can come up with would be a minisplit in my office and that wont be happening since we just replaced the AC last year. Great article, Allison. However, there are even more drawbacks to closing HVAC vents that need mentioning. If the supply duct in a closed room is closed off, the return duct creates a negative pressure in that room. This causes unconditioned air to be drawn through interstitial leaks from outside. The main body of the house pressure will increase slightly. One can see evidence of this by monitoring the change in house pressure when a closed room supply duct (or return duct) is closed. If the closed off room with a closed supply duct has an air pathway to the CAZ, the CAZ pressure will be lowered. I have seen CAZ pressures up to -15 Pa. in this scenario. In one house, the second floor bedroom (with closed door) with a closed supply duct depressurized the basement CAZ to -11 Pa.
One needs to be aware of the whole house implications of closing HVAC registers, not just the implications to the HVAC system. I wish I read this before my compressor blew last year and cost me $2k for a new one. When they built our townhome, they put a duct under our dishwasher that they they had to cover up, so we're already working with a permanently covered vent. Then I have other areas where I have reduced airflow (vent right behind a door)...so last year my compressor blew and I believe it's because the problem you describe above where it froze up. Great article and I have preached this for years to leave all the supplies and returns open all the time in every room. But this year I have found myself closing some vents on first floor to force colder air to the second floor. Don't like doing this but only thing I could do to cool off my second floor. I have done all the air sealing and have R50 in Attic. I run into to these folk who say they balance your system so what say you. As an aside, I just did a static pressure test to discover I have 1.1 total and my system says I should be at .5. I live in a tract home built 13 years ago with a 130,000 Btu system and I am confident it is almost double over sized but not able to replace it yet. How about all the stories I've heard about people draping blankets, sheets or draperies at the top of stairs (in multi-floor homes) to cut down the flow of warm air to unused upper rooms in Winter or decrease drafts year round? It's amazing what people can come up with that "they are convinced" help them cope with building science issues. Thanks for your thoughtful analysis. I absolutely agree with your conclusions regarding increased duct leakage (assuming the ducts are not properly sealed). I have one question however; you stated "Less air flow means the blower works less hard. Less work means less instantaneous energy use, but since it'll probably run longer, any savings there are unlikely to materialize." Richard - if ducts are accessible such as via attic, it is usual a simple matter to add manual balancing dampers. Chris - the failure mode for frozen coils and blown compressors is that the TXV (refrgerant metering device) pinches down in response to low airflow across frozen coil. Compressor windings and bearings are cooled by proper flow of return refrigerant gas. Ideally the compressor is saved by a low pressure cutout, but sometimes those are left out in a race for the lowest possible price for code minimum systems. I hope you got some warranty relief! Running with extremly high statics on an ECM motor is also a great way of shorting its module's life. thanks...now I can just refer people to this article & save myself time from repeating the same thing over and over. as we experience wall and ceiling (and floor) temperatures via long radiation, our comfort is based on just this. by having rooms and exterior around us that are either too hot or cold defeats the purpose. Particularly with ducted system. Insulation is the only key, and twice the code. Allison, How very odd that your illustration shows ductwork in the attic, considering the campaign currently being waged by energy and green building experts (including you, I presume) to get ductwork out of these unconditioned spaces. As several have noted, it's sometimes desirable to modulate the amount of air going to different rooms, to account for difference in loads from winter to summer, especially in single zone multi-floor homes. The answer of course is that it's certainly possible to design a system that accomplishes this, but the key word here is "DESIGN"... it must be designed that way. When a homeowner starts closing multiple registers on a system that's already has restricted airflow (pretty much the norm), the at best, it's going to impact system performance and efficiency, and at worst, well, all of the above. @Armand, the reason the blower might run longer is that the higher pressure will cause a PSC motor to slow down. This will reduce system capacity, so a cooling or heating call will take longer to satisfy. And since lower airflow will reduce the sensible efficiency of an A/C, it will increase operating costs. They seem to be getting a lot of press - I ran across them because Builder Magazine featured their product. An important concern not yet mentioned (and this is true of zoned systems as well) is that if you shut off the heat in an unused room, it can create conditions for mold growth and condensation on windows, depending on interior moisture levels. The risk is obviously going to be greater in a tight home, since it naturally has higher winter RH levels. The reason to install a zone control system is to achieve better airflow balance as the relative loads in different parts of the house change from winter to summer, day to night, and upstairs to downstairs, not to shut of the air to unused rooms. Unfortunately, many mechanical contractors don't convey this message to their customers. If at any time the cool air drops below a minimum temperature or the warm air goes above a maximum temperature, the E-Vent overrides its settings and opens up, protecting your Heating and A/C system. Um.... if the vent is closed, and no air is flowing through it from the HVAC system, how exactly would this temp change take place? Eric wrote: "...if the vent is closed, and no air is flowing through it from the HVAC system, how exactly would this temp change take place?" Good catch. I didn't see that on the E-Vent website but it gets worse. In order to "protect" the HVAC system, the vent would have to monitor the temperature directly at the output of the heat exchanger or DX coil, and even then, the acceptable range (let alone the efficient range) will vary depending on the particular system's design. A small pet peeve, though - you wrote: "The PSC motor, on the other hand, will keep spinning merrily along at the same speed." The PSC blower speed (RPM) under higher static pressure will actually drop, and along with it, the airflow as well. Dale S.: Dang! That was supposed to be in this article. I even wrote up a whole article about that topic the week before this one as a lead-in to this topic. I've expanded the list of unintended consequences to include that. Thanks! Armand M.: I've revised that part of the article because it wasn't clear and because I was wrong about one part of it, as John Semmelhack pointed out in his comment. Janell: Yes, I'm campaigning to get ductwork out of unconditioned attics, but I'm also not fighting against reality. Sadly, there are many, many systems in attics. Eric C.: Oh, no! That's horrible. Even worse, some of their grilles look much more restrictive than the ones they'd be replacing so even when they're open they're making things worse. David B.: Thanks for bringing up the mold and condensation issue. I've added that to the list. Eric S.: Like David, I also missed that on their website. My first thought was the same as his, too. If they're not measuring at the coil or heat exchanger, they're not protecting the system. John S.: Oops! It's fixed now. Thanks! One thing to note. When a PSC motor driven fan experiences increased static pressure it flows less CFM and its watt draw drops. What if the system is checking the static pressure across all of the vents? What about if it tracked the on time of the system and minimized that, couldn't it possibly account for duct work loss. I think they would have better luck operating them thinking of it as dynamic balancing instead of a weird aftermarket zoning system. @Dwayne, measuring static at the grille isn't helpful since there's virtually no static to measure at an open grille. The only static that matters is total static, which must be measured on either end of the air handler. Your second comment also makes no sense. System run time varies depending on current load and other factors that have nothing to do with duct system pressure. As for your third comment, I'm not sure how your concept of 'dynamic balancing' is any different that what a zoned air distribution system is designed to do in the first place. Regarding your first comment. My thought is that you might be able to measure the total pressure at each register with all of them wide open. Then a relative adjustment should register at all of the end points (if there wasn't additional pressure at the registers, then there wouldn't be more at the back end). I have to assume you believe in Newtonian physics? I don't think you understood the second comment and I certainly should have explained it better. It seems like many say closing registers -> increased pressure -> potentially increased duct leakage - which makes a lot of sense. My comment was that with a smart system, it should be able to learn whether closing registers is causing additional leakage or any other inefficiency (well maybe not increased current on the blower if its an older unit) by observing the total time the system is on. Assuming a fixed temperature and consistent weather, it seems like by simply observing the on time of the system one day, and then changing the registers and observing the next day, an intelligent system could learn how to minimize on time. Dynamic balancing is more fine grained. If the east facing bedroom is warmer in the morning, old school HVAC cant handle it without it being too cold later in the day. These devices seem like they are trying to eek out energy and solve some building science problems that traditional HVAC has ignored. I don't expect traditional HVAC contractors will embrace something new, because 1) they have seen what can and very well might go wrong and 2) they are somewhat set in their ways and will reject a higher tech solution that didn't exist when they were training. It might mean that these systems are limited to newer construction where newer blowers, compresses and furnaces can handle more dynamic loads. It could allow for a time domain multiplexed system where a smaller central unit can handle a larger space, say based on occupancy. These systems could be totally problematic and not do as promised. They could alternatively be the next version of HVAC. I certainly don't know. Dwayne wrote: "I have to assume you believe in Newtonian physics?" Are you serious? Please don't patronize me about physics when you apparently don't even understand basic duct system pressure concepts. I mean that with no disrespect. The static behind the grille only represents tiny resistance of the grille itself, not the resistance of the upstream components. Also, you can't add static pressures for what are essentially parallel paths (think parallel versus series resistance networks in electronics). Bottom line, the sum of static pressures taken anywhere in the branches has no correlation to the total external static that that blower sees, which is what's at stake here. You could (theoretically) measure and sum the velocity pressures at the ends, but getting a representative sample is a lot more involved than you might imagine, and that still doesn't correlate to blower output, at least not without the cross-sectional area of every measurement point Good luck with that. "It seems like many say closing registers -> increased pressure -> potentially increased duct leakage - which makes a lot of sense. " Perhaps. But duct leakage isn't the side effect we're concerned about, It's all about airflow across the refrigeration coil or heat exchanger. In any case, the solution to duct leakage is to seal the ducts. "Dynamic balancing is more fine grained. If the east facing bedroom is warmer in the morning, old school HVAC can't handle it..."
Dynamic balancing is what any properly designed zone control system is supposed to accomplish. In fact, this should be the primary objective. In particular, zones should be organized based on similarity of load dynamics, and only secondarily on how the rooms are used. Not many contractors understand that. I would argue that the "old school" folks were much better than most of today's crop who purchase a software tool and think that makes them an expert. Bottom line: what's missing from zoning is not product innovation but application design skills. Smarter products will not change that, especially if the folks conceiving the products don't even understand the fundamentals, which seems to be the status quo with today's connected-everything world of phone apps. @Dima, if you added a couple of vents, then closing a couple of others is probably fine. Unfortunately, very few residential HVAC installers test the static pressure of the duct system, or balance the airflow (perhaps because builders don't know to include these basic tests on their specifications). I recommend having a qualified technician (National Comfort Institute or NATE) perform static testing and air balancing on all homes with forced air heating and/or cooling. That way your system isn't based on guesswork. @Jim, sounds like your ducts are flex with the black plastic outer liner. It serves as a vapor retarder to prevent moist air from condensing on the inner liner during cooling operation, and (2) as an air barrier to prevent air from permeating the insulation layer, which can seriously degrade the effective R-value. In order to function properly, the vapor retarder (plastic or foil outer liner) must be continuous and carefully sealed at all seams. If ducts are located outside of conditioned space (vented attic, crawl space or unconditioned basement), you need to get this repaired. A local contractor would need to look at the ducts to see whether it makes sense to try to re-wrap or replace the ducts. It's usually better to replace, but that will depend somewhat on ease-of-access. I turn off the vents and I block the return air flow also , so according to what I am reading here , this isn't the best way to save . Joe. It isn't the BEST way to save, but what is the best way depends on your house, your heating and cooling system, and our climate. Ceiling insulation, duct sealing, duct insulation, Air sealing at the plane between the attic and inside, wall insulation. Boy, I'm glad I found this site. For my situation, however, it raises even more questions than it answers. I just bought a one-story house in northern Iowa, and we're facing our fist winter here (brrr!!!). The house was built in the 1920s, and was added onto in the 80s. The original portion of the house (~950 sq ft) has service and return ducts that seem really poorly situated. The home energy auditor even pointed this out. Basically, the service vents are located so close to the returns that the air only heats a few corners of the main living area. The main issue though, which brought me to this site, is my cold bedrooms. Okay, so picture this... There are five main duct lines that emerge from my gas furnace blower: 2 to the addition, 1 to the living room nearby, 1 to the humidifier, and 1 to what I call a "main line" with several additional branches. Anyway, the bedroom heaters have always seemed to pale in comparison to the living room heaters. Turns out, the living room heaters are all further up the "main line", and the bedrooms are the last of several vents along just 1 of 5 service lines altogether. This morning, I thought to myself, I've had enough, and I closed all the dampers to the living room service ducts - thinking that, since they're poorly situated as it is, it would almost be a waste not to close them. Also, consider the two service lines going to the addition (which I left open) were added in the 80s perhaps spreading the heat too thin. It felt like that anyway, because by the time the hot air got to the bedrooms, it was weak and barely warm. So, my question: Would closing, or at least dampening a few of the poorly situated service lines be all that bad? Might doing so offset the extra service ducts added when the addition was built? Closing some of the service vents certainly achieved the goal of sending warmer (and stronger) air to the bedroom vent I left open. It was nice to actually hear the air coming in. But I obviously don't want to damage the furnace. So, follow-up question, is there anyway for the average homeowner like me to test the pressure in the vents to get the perfect balance between sending the air where I want while maintaining safe pressure? It would be nice to just leave everything wide open like this article suggests, but as it is now, my heating system is very poorly situated and unbalanced. Thanks in advance for any help! @Codie, essentially, you rebalanced your furnace's airflow by trial-and-error. There are some potential downsides to doing this yourself. As noted in the article, closing vents reduces the total system airflow, which causes the supply air temperature to rise in heat mode, and to drop in cooling mode. Furnaces have a wide operating range, so closing a small percentage of outlets isn't likely to cause a problem, especially since vents had been added to service the addition. In cooling mode, a reduction in airflow can affect on performance. If you have central A/C, you'd like to know if your efforts materially changed the evaporator's performance. At a minimum, you'd need to check external static at your furnace and compare that with the blower table to estimate system airflow. Learning how to do this properly and to assess the results isn't trivial. Also keep in mind that if your bedrooms don't have individual returns or transfer grilles (or a large enough door undercut), it may be impossible to get enough air to those rooms with doors shut, at least not without causing an outsized effect on the system and the rest of the house. And without adequate return paths, you'll end up with too much air in those bedrooms when the doors are open, and not enough air in other rooms. So the first step in any air balancing job is to make sure there's an adequate return path to each room. The standard is to have less than 3 Pascals pressure difference across closed doors with HVAC blower running. This ensures that opening and closing doors will not materially affect air balance. @ Codie: What a Pickle. Whoever did the add on apparently messed up the balance of the system that may have been present before. Hard to say. There are two ways for a regular person to determine whether the total airflow through a furnace is sufficient. Then measure the temperature of the air existing the supply grille nearest the furnace. The difference in temperature is the heat rise. Then look on the specifications plate inside the furnace (is should be inside the front panel. If your heat rise is within the range specified by the manufacturer, you will be OK. Method 2) Turn up the thermostat as high as it goes. Then go watch the furnace. If the burn is not continuous (cycling on the limit switch) Then you definitely have trouble -- mostly durability issues. While there are many experts that advocate for a return in every room, or some specific return pathway. I am not in that group. In the Southwest people get by all the time with a single return in the house. It may not be ideal, but it works. What you are doing by closing off registers is the same thing a professional balance company would do, except they would do it at a damper right by the where the run to the room takes off the furnace plenum or main trunk line. I hope all these terms are not too confusing. In the end, you want to be comfortable in your home, bedrooms included. If you can check the heat rise of the furnace, then doing some DIY balancing is understandable, if not ideal. With respect to the close proximity between the return and the supply registers. This should not be a problem if the velocity leaving the supply register is high enough (throwing the air across the room). Good luck and save up some money to have a good performance contractor come put in a good system (ducts, terminals (aka registers) and furnace) when you are ready. Great article, but it made me think about something with an issue I'm having. My house has 3 air registers in the basement, 9 on my main level and 7 on my upper level. People who have similar setups and also open all their vents usually have to deal with their basement being colder than the rest of the house all year round and the upper level usually being hotter that the rest of the house all year round. What's the usual remedy? Close off the 3 basement vents in the summer time while leaving the rest of the vents in the house wide open and also closing off some of the vents on the upper level while leaving the other vents open in the rest of the house during winter time. I'm not sure if this would work, but what if I set my vents on my main floor to a half open position all year round and then partially open my basement vents in the summer time while FULLY opening my upstairs vents? In the winter time, I could partially open my upstairs vents while FULLY opening my basement vents. Does this sound like something that may work? It seems like it could because none of my vents would ever be fully closed at all. I also never have issues with my main floor ever being too hot or too cold. I should also point out that 2 of my upstairs bedrooms have no return air vents. @Sean, fixed-volume duct systems are, by definition, a compromise even in single floor homes since solar gains significantly change the load balance from morning to afternoon, day to night, and winter to summer. These impacts can be minimized with good duct design, window selection and shading. However, it's unreasonable to expect a single fixed-volume heating/cooling system to maintain consistent temperatures across multiple floors, especially winter to summer. Each floor needs to be set up as a separate zone with its own t'stat, either with one system per floor or automatic zone control (or a combination). Some states now require multi-floor homes to be zoned. Seasonal air balancing as you propose can accomplish similar results. But doing this yourself has downsides (see my above response to Codie). Maintaining adequate airflow in cooling mode is especially important, which is why I advise against DIY air balancing. A professional air balancing technician, aside from balancing branch ducts within each floor, can install manual balancing dampers in the upstairs & basement trunks, with marks or limits to assure the right amount of adjustment each season. Of course, this assumes those trunks are accessible. The main point is the importance of verifying system airflow when doing this sort of balancing, since this creates additional back pressure on the blower. More often than not, system airflow is already too low, even with vents fully open, due to undersized or poorly installed ducts and/or overly restrictive filters. In this case, the duct system must be modified, typically by adding one or more returns or supplies, increasing filter surface area, or all of the above. Sometimes it's just a matter of increasing the blower speed. A qualified technician can quickly sort this out with simple diagnostic tests. Question specific to heating mode: Can an a add-on system accomplish "balancing" by monitoring the variables at the motor/furnace while adjusting air flow to individual rooms using room vents with boost fans and opening/closing vents? Controlled by room thermostats? Can thermostats in every room can be set which gathers individual room temps and turns on/off room vent boost fans while opening/closing other vents as required while measuring the system vitals at the blower/motor/furnace. In other words, electronics monitor the system vitals and adjust the vent openings and boost fans. Is that possible? @R.Poulin, what you describe is essentially an intelligent zone control system. Systems that do most of these things already exist, but they require professional installation. Even the smartest system doesn't eliminate the need for an installer who knows what s/he's doing. BTW, modulating airflow to rooms by partially or fully closing the vents isn't the best strategy for a couple of reasons. First, air that bypasses a partially closed vent can create a lot of unwanted noise. Balancing dampers are typically installed at the beginning of supply branches or trunks, so any airflow noise is removed from the room. Second, motorized vents cost more than motorized in-line dampers (and much more than manual balancing dampers). Moreover, you'd need one for every supply outlet. Keep in mind that larger rooms often have more than one vent. Also, when designing a zone control system, rooms are typically grouped into fewer zones. So by placing dampers further upstream, you only need a fraction of the dampers, as well as fewer thermostats. Zone control is least expensive and works best when installed at the time the home is being built and the duct system specifically designed for zoning. But wireless technology is making zoning more accessible for existing homes, although you're pretty much limited by whatever duct topology you inherit. So perhaps the best "add-on" (retrofit) system for room-by-room individual heat control/comfort would be small elec. boost heating vents which replace the hot air vents in the rooms you desire more heat? Remove the existing room hot air vents/grills in the rooms you spend more time in, and replace them with vents/grills which have built-in heating elements. Of course, they would need to plug in to a elec. receptacle to power the heater, but they would be almost unseen as they would be inserted into the vent. They could be designed to operate when the air flow is blowing only (the system is already running). They would "boost" the air temp in the rooms needed right at the point of air entrance and be "out of sight". Would not be surprised if someone already makes something similar. Someone just posted this on Facebook, and I had to refute every one of the claims in this article. So, for sake of sanity, I'm sharing that here. No! In fact, one of the premises of the article is that higher pressure makes the fan work harder - the exact opposite is true. When you use your hand to plug a vacuum hose, does the motor spin faster? Of course. That's because the motor has *LESS* working against it in the vacuum - less moving air means the impeller free-wheels against a vacuum. Same applies to pressure on a fan blade - less moving air, less force being applied to the motor, so the motor speeds up by the nature of its operation (speed is a factor of the work being done). Leakage is a minor concern, but duct work isn't just slipped into place and left there like it won't go anywhere. Leaks mean the duct isn't even attached to the outlets, which is a very BAD thing for more reasons then just this. Most ducts I've seen are sealed to the outlets with some pretty secure tape, and that means no leaks are possible of any worthwhile consequence (we're talking a whisper of air versus a whirl of air). If it's leaking anyway, you can only make it very marginally worse by blocking it. And... the benefits you gain by blocking a vent mean you're no longer heating the unused material in that room - the walls, floor, ceiling, all stay the same room temperature, and conduct heat through them to the outside. So if the unused room's vents are closed, and you walk in and feel it cold, that cold (or hot, if you're using A/C!) feeling is all the energy you saved by not keeping a large temperature differential between that room's materials and the outside world. The air circulation exchange argument (I didn't see it, but it's another common myth) is also bogus - in fact, blocking an unused vent in a closed room is a GOOD thing there, since air usually escapes under a tiny crack under the door, creating outward pressure on the room for air to escape through outlets and other holes to the outside world. With a blocked vent, you're creating less pressure in that room that would need to escape under that door crack (or through the outlets!) and most would go back under the largest "in-loop" space - under the door - instead of escaping. Matt F.: If your knowledge of building science and mechanical systems matched your indignation, your comment might be more convincing. Apparently you've got some fixed ideas stuck in your head because you don't even seem to know what I wrote. You might want to check what I wrote about PSC vs. ECM blowers before you tell me about blowers working less hard. 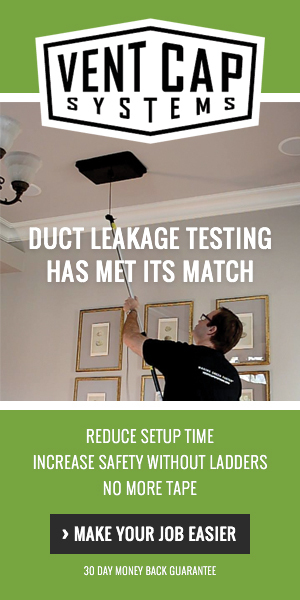 You might also want to find out how bad duct leakage really is. It's far from a "minor concern" in most homes. And then to close by refuting something you didn't even see in the article proves that you're operating from some imagined position that doesn't apply here. Really, Matt? Is that the best you can do? The reality is that virtually every vent installed in a home has adjustable louvres yet putting a motor on them and informing that with sensor data makes old school HVAC pros uncomfortable. The reality is that saving energy is only one facet of this whole question. The HVAC crowd of yesteryear is convinced that the systems are adequate as is, but talk to many people and they will tell you that rooms heat/cool unevenly due to floors (higher floors get too much heat and winter and not enough AC in summer), sunlight, or other dynamic conditions. Whether it saves money aside, and whether the built environment is compatible with dynamic loads and increased static pressure aside, the reality is that the HVAC industry, particularly the residential side, is in for massive change as cheap sensors and software companies start to eye the space. The traditional HVAC contractor is going to get left in the dust, dragged in kicking and screaming the whole way, or cautiously embrace perhaps. Customers are dictating smarter, more comfortable, more efficient systems and the old guard of the HVAC world has been failing for quite some time. Joe M.: Oh, where do I start? You clearly don't understand what this blog is all about or my relation to the HVAC industry. You wrote, "The HVAC crowd of yesteryear is convinced that the systems are adequate as is...," implying, I think, that I'm part of that yesteryear crowd. Perhaps you should check out some other articles here before you speculate wildly. Second, products that affect only what happens at the outlets of a duct system can never have the widespread positive benefits you envision. Yes, they may help a house here or there, but they will also cause a lot of problems and those "software companies" you refer to are going to be "failing for quite some time" into the future if they ever grab any kind of a foothold. "Bottom line: what's missing from zoning is not product innovation but application design skills. Smarter products will not change that, especially if the folks conceiving the products don't even understand the fundamentals, which seems to be the status quo with today's connected-everything world of phone apps." You could start by addressing more of my comment - all of your 'evidence' is anecdotal fear mongering. Or feel free to explain why most registers contain articulated louvres, today. Its more convenient to quote some guy who categorical writes off any future enhancement to this 'perfect' system. "Old school" HVAC guys vs. "new school" HVAC guys = red herring. Truth is, some of us "old school" HVAC guys have a functional understanding of physics as pertaining to our trade. The addition of smart phone enabled apps and powered damper actuators on residential supply air registers changes none of that. Any time total volume of a fluid flowing over a heat exchanger is reduced, the total amount of heat exchanged between the HX and fluid is likewise reduced. Closing off dampers in supply registers will accomplish this very thing. BUT! Some might say...won't the air in contact with the heat exchanger actually contain more heat or give up more heat due to the increased dwell time (reduced mass flow rate) with the exchanger? In the case of a DX evaporator for an a/c system in cooling/dehumidifying mode, it is true the air passing through the coil will become colder than it would under a higher mass flow rate. However, the temperature difference between the air and the boiling refrigerant is also less, hence an overall reduction in heat transfer between air and coil. It is a net loss of system operating capacity. Therefore, if closing off dampers in unused rooms resulted in nothing more than a reduction of system capacity as outlined above, the only heartburn would be just that. However, with cooling coils condensing moisture and hermetic compressors that require a safety margin of suction gas superheat to prevent compressor destruction, reducing mass air flow over the indoor coil via closing off supply register dampers is antithesis to all of that. Some of us may be "old school" but that does not equivocate to "knuckle dragger" or "luddite". Joe wrote: "Its more convenient to quote some guy who categorical writes off any future enhancement to this 'perfect' system." Wow. Anyone who's read more than one of my comments in this blog over the years knows I would never consider the status quo 'perfect'... far from it. The status quo in residential HVAC (perhaps what you refer to as old school) is pretty darn awful. But it's not for lack of innovation. It's because improvements that are both useful and practicable are really hard to come by. But one thing is certain... you can't innovate without first understanding the fundamentals - refrigeration 101 and air distribution 101. Then we can talk. @Matt, you seem to be a bit confused about blower motors and pressure. An ECM (constant torque or constant velocity motor) will speed up when back pressure is increased. This is an energy hit, but there's a limit, after which the motor will begin to stall. On the other hand, a PSC motor will consume less energy when back pressure is increased (as you assert), but it's because it slows down. It does NOT speed up. But here's the problem... when back pressure is increased, the motor moves less air (as you acknowledge), and therein lies the problem. Less air across the heat exchanger and/or evaporator coil can spell trouble, depending on whether airflow was already low to begin with. The point is that it's a bad idea to do anything that effects system airflow unless you're trained to measure and evaluate the impact of those changes. So any DIY product that affects duct system pressure needs to be called out for what it is. Your assertion that leakage is a minor concern couldn't be further from the truth. Just because you imagine it's not an issue doesn't make it so. There are plenty of field studies that quantify the impacts. Just google FSEC and duct leakage for example. It's one of the top sources of energy waste in the home. You're correct that shutting off heat to a room can save energy. The point of the article is that a DIY zoning system is a bad way to achieve that. Also, in newer, tightly built homes, indoor humidity may be high enough (in winter) to create mildew/mold issue in rooms that are allowed to cool down too much (or worse, inside the walls of those rooms). Vapor pressure tends to equalize absolute humidity levels throughout a house, even under closed doors. By the way, relying on the crack under a door as the return path for supply air is poor design practice (although very common). As a general guideline, a door undercut can only relieve about 2 CFM per square inch. More than that will tend to starve the room of supply air. Good design practice is to have dedicated returns in rooms where the door crack isn't enough to relieve the design supply airflow. Better design practice is to use a jump duct or transfer grille. I have to start out by saying I love you articles. I Have spent my early career installing multiple zone systems as they were getting laid out in the HVAC in the early 90's . I was taking classes at the main distributors and thought I had a good grip on my product. Boy, I was wrong. We have spent the early part of 2000 replacing furnaces because these zone systems did not perform as we were told. Bypass dampers were killing the secondary heat ex-changers along with blowing up the house with incorrect room pressures. I would think very hard about installing a zone system in any project. Rick Chitwood has a correct way of installing a zone system by designing for full operation per zone. Still I believe it is super hard to do it correctly. This new type of zone system would logically seem brilliant but it is actually disastrous. I guess this is more repair work for the HP industry as if we do not have enough to fix.